Somewhere in the bowels of Ronnie James Dio's home there is a very special place. That place holds a portrait that ages for him. Yes, Dio is eternal. In many ways, Master Of The Moon chronicles the career of one of the reigning giants of heavy metal. The opening salvo, One More For The Road, roars out of Rainbow territory, complete with a crunchy and bluesy guitar lead, seething percussion, and of course Dio's booming voice. The title track slows things down a notch, with guitarist Craig Goldy and bassist Jeff Pilson paying homage to Black Sabbath's Mob Rules. Next up is The End Of The World, which oozes classic Dio with its doom-metal pace, chug-chug-chug guitar riff, and cymbal-to-snare rhythmic pattern. Then there's Shivers, possibly the strongest track on the CD, with its snarling vocal lines, spooky lyrics, and six-string hooks. The Man Who Would Be King revisits territory explored on Ritchie Blackmore's Rainbow and Dio's The Last In Line, and the resultant fusion is mesmerising. The Eyes brings with it a creepy yet compelling vibe, much like his work on Magica, and Living The Lie, slides to the opposite end of the spectrum, with Dio and company creating a bluesy, catchy composition that hearkens more to hard rock than heavy metal. I Am is surprisingly weak song, particularly with its often-repeated two-word chorus, but Death By Love sets things right with its straightforward but heavy style. The closer, In Dreams, is perfect, from Simon Wright's percussion to Scott Warren's gentle hands on the keys. 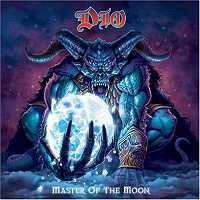 Master Of The Moon represents the other side of Dio, the side away from epic-metal releases such as Magica and Killing The Dragon. Taping into his roots (maybe as far back as Elf), Ronnie James Dio has created a bluesy but heavy sound that may leave some scratching their heads. Give it more than two to three listens - you'll be hooked.